Silikal® withstands mechanical abrasion forklifts and chemical attack, designed to hold up to the harshest conditions. Silikal® just may be the most durable floor on the market. Silikal® reactive resins are developed, manufactured and sold in conformity to the strict quality requirements of ISO 9001: 2000 & under a qualified ISO 14001: 2005 environmental management system. Silikal® America offers licensed applicators in all 50 states in addition to Canada & Mexico. Click Here to locate your nearest representative / licensed applicator. Why Enhanced MMA resins? According to the Georgia Aquarium, acrylic is 17 times stronger than glass. It is not glass holding back the millions of gallons of water at the Georgia Aquarium, it is the same ingredient that makes up the reactive resin component of Silikal® flooring systems. Silikal® is a renewable floor designed to last the lifetime of the structure. Interested in LEED's credits? You may qualify. It is the entire extra that Silikal® offers that takes a Silikal® floor from ordinary to extraordinary. Silikal® flooring will not harbor bacteria and molds it is a non-porous, pinhole free seamless flooring surface. 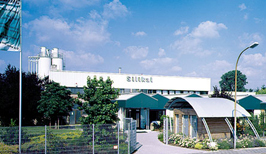 A Silikal® floor is a clean floor, great for kitchens and food processing facilities. Flooring that's easy to maintain. Due to its non-porous nature water, dirt, and bacteria rest on the surface unable to attach itself to the floor making them extremely easy to clean and ideal for restaurants and kitchens. Anti slip flooring surfaces that prevent or reduce slips, falls and flooring slip related accidents. Silikal® withstands mechanical abrasion forklifts and chemical attack, designed to hold up to the harshest conditions. Many flooring colors & flooring designs are available for wet, cold & hot conditions or in combination. Silikal® flooring will provide years of service with limited maintenance, lower life cycle cost. Save money on expensive maintenance costs with Silikal® flooring. Silikal® bonds chemically to itself without sanding or grinding. Repairs are quick and painless. Both our commercial flooring and industrial floors can be installed down to Zero Degrees 0°F Which means no down time for your commercial or industrial business. Silikal® is unlike other floor used for commercial or industrial locations. These inferior products will allow penetration of bacteria, dirt and water to name a few everyday flooring threats because of their porous nature. This in turn creates a cleaning and longevity nightmare. Silikal® on the other hand will give you a totally seamless floor surface that is completely pinhole and porous free in addition to being an extremely strong industrial floor! Inspectors who come to your place of business will have a difficult time finding issue with your Silikal® floor. This allows you to worry less about fines or threats against your establishment as some do that did not use Silikal® for their flooring. Thus it is the perfect flooring for food establishments, bakeries or dairies, not to mention school kitchens either. Whether flake or quartz, clear or colored, Silikal® systems can solve almost any flooring problem. Flooring that is smooth in transition protecting the substrate. Silikal® floors are perfect protection for commercial environments where quality flooring is a must! Thinking About Having Silikal® Floor installed? Let us tell you why you should choose Silikal® reactive floor resin. Here are two strong points; most competitors' products used in industry flooring will not be able to withstand chemical spills, even those products that say they are made specifically for industrial flooring. Silikal® floors are very strong and extremely resistant to almost anything including chemical threats. Now take commercial flooring, which has a tremendous amount of traffic that will eventually wear down over time, in most cases not much time at all. Not Silikal® , Silikal® flooring is so tough, we say it is the “No downtime floor that lasts a lifetime.” So you can see that industrial & commercial flooring must have the tremendous wear ability and resistance that only Silikal® has. That is why when facing the tough decision on which floor you should choose, pick Silikal® floor resin and you will be glad you did. Silikal® America Website | Payment | Disclaimer | Site map | Network | ph. +1 888 830 1404 | Expect more from your floor.